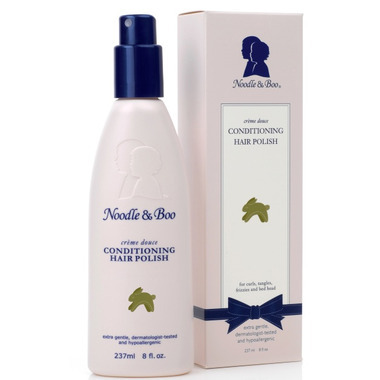 Noodle & Boo's complete-care approach ensures that each part of baby is carefully tended to with products that are safe, effective and specially created to work together for exceptional results. Pediatrician-tested and hypoallergenic. Smooths the hair cuticle to reduce frizz leaving hair weightless with beautiful shine. Directions: For very little hair, lightly spray polish on damp hair after shampooing with our Extra Gentle Shampoo. For longer hair, spray a generous amount of polish on hair starting at the ends and working up towards the scalp. Carefully comb hair, working from the ends to the scalp. For "bed head," saturate hair with polish and style as usual.